Happy Humpday dolls! We had some seriously dreary weather here this weekend! While I definitely don't mind the occasional rainy/cloudy cool day three days of it was a bit much for me. I am definitely glad it's back to being sunny today but I guess when I'm hoping for more fall like weather I need to be prepared for what comes with it, huh? At least our random cool days allow me to break out cute sweaters like this one! I absolutely love layering for fall and winter, especially when it involves dainty layers like this lovely lace hemline! There's just something about a fun chunky knit sweater layered with lace... or a good moto jacket paired with lace. Are you sensing a trend yet? ;) Not to mention I'm definitely loving gray! How do you feel about layering? Such a pretty sweater, love the way you have styled it here. I could wear heels everyday if I had the chance! Totally pinned these girl love that layered look! So glad Al got you home okay ;-) So awesome seeing you!!! Weren't those mojitos amazing?! Beautiful sweater! I love the lace peaking through!! I LOVE that sweater! The lace detail makes it look so girly while also being comfortable. Great look, girl! This sweater is so cute! Layering is the absolute best! Love that top! So feminine and looks comfy too! I love the lace details! It adds such a fun feminine pop to the whole look! I love this outfit!! Love love that sweater!! So fab!! I love that sweater and you look beautiful as always. girl your lips are killer!! 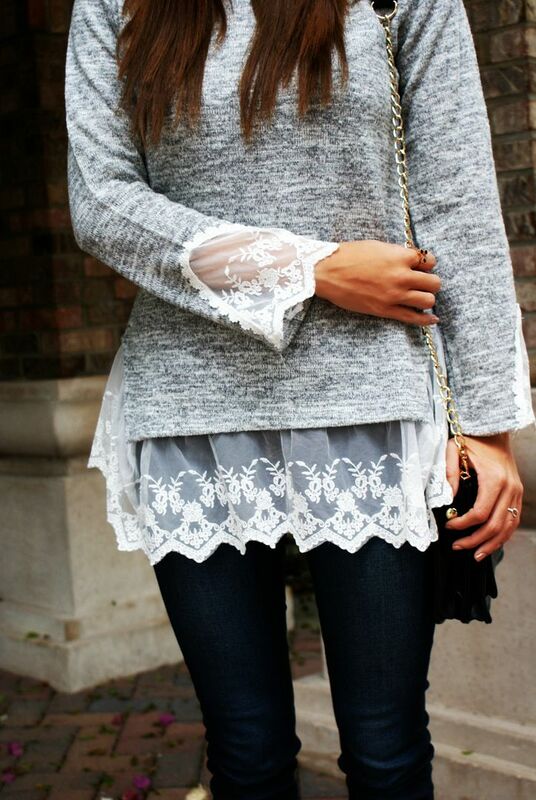 The pairing of the lace and soft sweater is so lovely too!!! Such a cute sweater! I love how you styled it with skinny jeans and a simple bag! Gorgeous! sooo cute! love the sweater! Loove this sweater! The pop of lace is perfection. I want one! Cute look! I love the lacey under shirt! That sweater is beautiful, so girly & chic! Awesome sweater! PS How is your grandmother doing?! LOVE that chunky gray sweater! Just ordered something similar and can't wait to start wearing it. 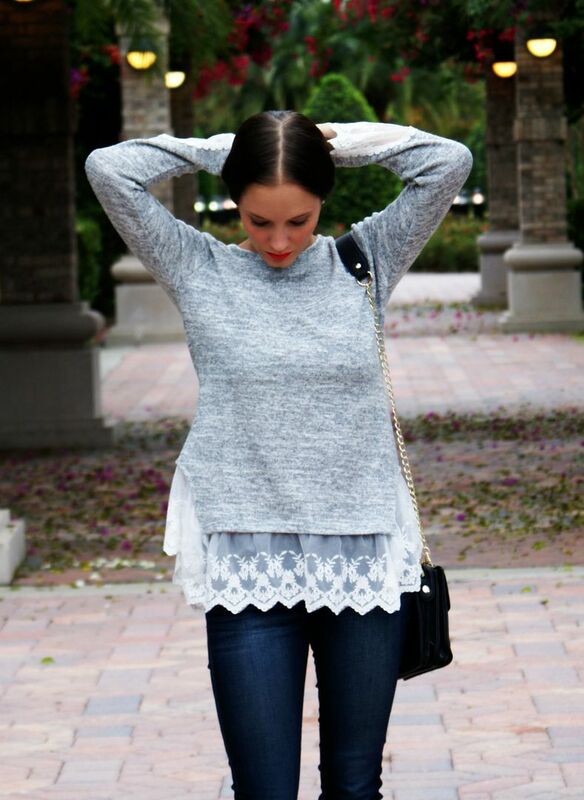 Pairing the sweater with the lace is so different and fun. this look is absolutely phenomenal on you. I wish I could pull it off! Ah I love this sweater! So perfect -- you look fab, girl! That top is amazing! Love the little details! love. the. lace. i NEED that!! I love that outfit, the sweater is so gorgeous. Layering is my favorite, hence fall being my favorite time of year... you can layer without being all bulky! I've been eyeing this top for awhile. It's just so darn pretty and you styled it perfectly! Oooohh I love how girly this top is! I'm a sucker for anything lace! Love that top - it's so chic!